Ultimaker 2, generally working great. I have noticed a problem recently where the extruder motor skips every now and then, on the first layer, and this leads to under extrusion for a few seconds. This ends up with gaps or very fine sections. I notice it mostly in the first layer, which is set to 0.3mm. I don't know what the UM2 can do, but you're trying to squeeze 0.3*0.4*50 = 6.0mm^3/s through the nozzle, which may need too much force on the filament. 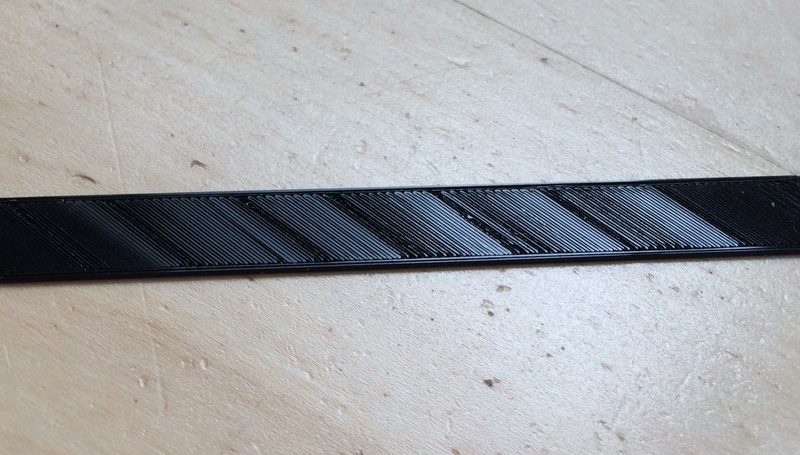 Try to reduce the layer thickness to 0.2mm, or reduce the XY speed to 30mm/s, or if you really want to print that fast, increase the temperature. Yes, 6mm³/s might be a bit fast, depending on your temp setting. Plus, if your bed level is off at all, the actual available space might be rather less than 0.3mm, increasing the resistance still further. So, re-check your bed leveling, and make the first layer a bit thinner and/or slower. Or print hotter. I am using Cura to produce REPRAP format, which is printed through Octoprint, but basically all defaults. Although the main speed default is 50mm, the first layer speed is 20mm/sec on defaults, so the real volume on the first layer, is actually 0.3x0.4x20 = 2.4 cubic mm/sec - I guess this should be OK ? I did re-level the bed, but from illuminarti's mail, I guess maybe the gap is too *small* ??? Looking at the head, it's not 'squeezed' against the glass on layer 1 - if anything its too high - the gap seems to be about the height of the unsqueezed bead - maybe 0.3 to 0.4mm ?? When the extrusion barfs, the bead gets very thin, and then its not extruded touching the glass and it waves in mid-air until the extruder kicks in again with full flow. The 'piece of paper friction' method is a bit vague - can anyone tell me the actual desired bed offset in mm ??? Could this be a friction setting issue on the extruder ? I am guessing not. looking at the prints, this does seem to be primarily a 'first layer' problem - since the rest of the prints seem pretty perfect. The gap that you are aiming for during leveling is 0.1mm. What is the gap between the bottom of the heated bed, and the top of the thicker metal plate when you've finished leveling. It should be somewhere around 12mm or less, to make sure that all the springs and screws are properly engaged. So, I just tried changing the first layer to 0.2mm instead of 0.3mm and the first print looks good, very flat and full traces. Since the bed offset is the same, and only the head offset vs bead size has changed, it would suggest that the problem before was the effective flow volume - ie. it was not giving me enough PLA for a 0.3mm bead. 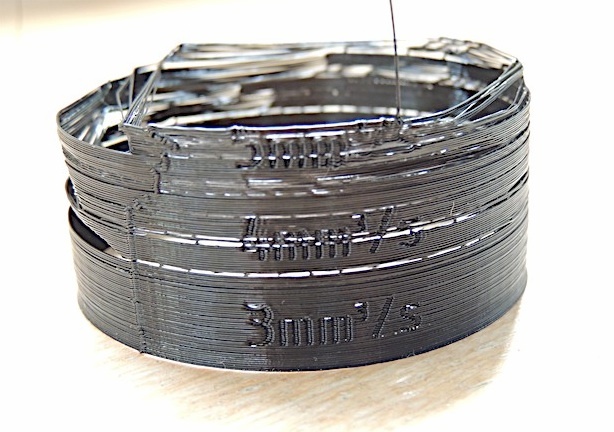 0.2mm at 20mm/sec is fine, and equally 0.1mm at 50mm/sec is fine for the rest of the print. 0.3mm at 20mm/sec at 210 degrees should be fine I presume, so if we think this was the problem, might it suggest my head is slightly blocked ??? it can't do 6 cubic mm/sec reliably ? (but can do 5). The kick in the extruder is presumably an effect of resistance in the feed through the head ??? So, I found the UM2 extrusion volume test print, and gave that a try, after levelling the bed and making sure the screws were tightened down far enough to give the springs something to do. I think this more or less identifies the problem. It's struggling to even do 4 cubic mm per sec. Anyone got any tips. I feel like my UM2 is deteriorating since its original performance - what are the maintenance steps so restore the performance ?